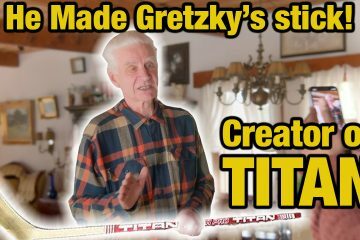 Today we are going to be taking a look at the Ribcor 70k’s. 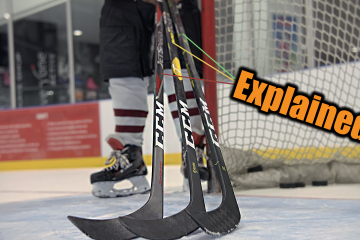 We are going to be looking at how they have changed from the previous generations the 50k’s, letting you know what CCM have changed and how it is going to help you on the ice. Starting out at the base of the skate not a lot has changed looking at the holder and the runner. Looking at the 70k’s they are using the SB black runners and the SB 4.0 holders, if we look at the 50k’s the setup is the same absolutely no changes. 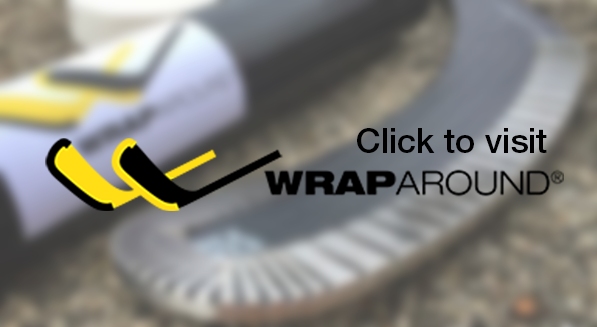 If you are unaware of what the black runner does it basically helps to fight against corrosion and also hold the edge a little bit longer, so you are going to be able to get better edge life while you are on the ice. Moving up from there to look at the outsole, the 70k’s are using CCM’s Power Transmission Carbon Outsole, which is a premium quality full composite outsole.Very stiff, very rigid you are going to get good levels of energy transfer making a very responsive skate.Also features a perforation at the base of the outsole making sure that any excess heat and moisture is able to exit the skate, helping to keep you dryer when you are on the ice. Taking a look at the outsoles on the 50k’s, again you get a fully composite outsole since these were the previous generation but still top spec skate so you can expect pro level features. Features multiple perforations as opposed to the 70k’s which only have one perforation to help with moisture management inside the skate. No real big changes in the base of the skate or in the runner and holder. Into the quarter package is where we are going to see the majority of all the new upgrades and changes. 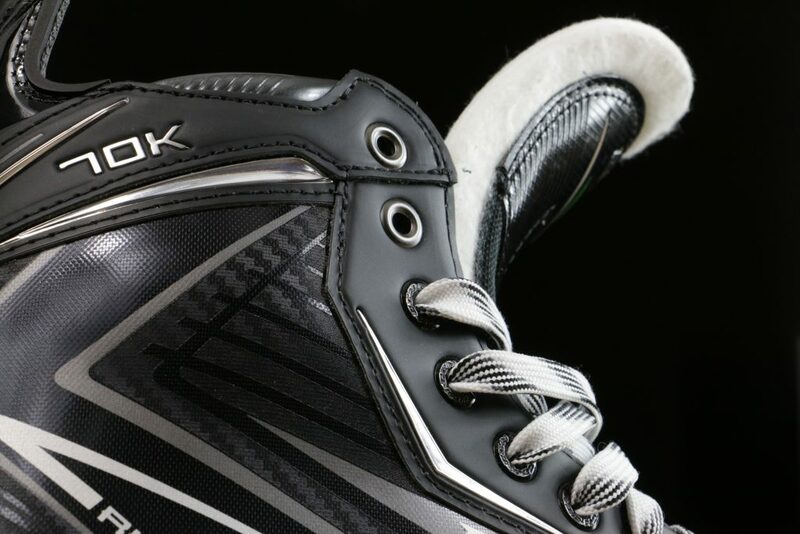 Working are way up on the 50k’s were seeing CCM’s Carbon Fibre Reinforced Rib Core Elite Quarter Package, based around promoting stability and stiffness around the rear sections of the skate.moving to the front of the skate around the eyelets this section was much softer much more forgiving to promote full forward flexion inside their boots. Over to the 70k’s we see a lot of changes, of course we are going to notice that there is no pump and no lace lock.. We will get to why that has been changed later in this article. 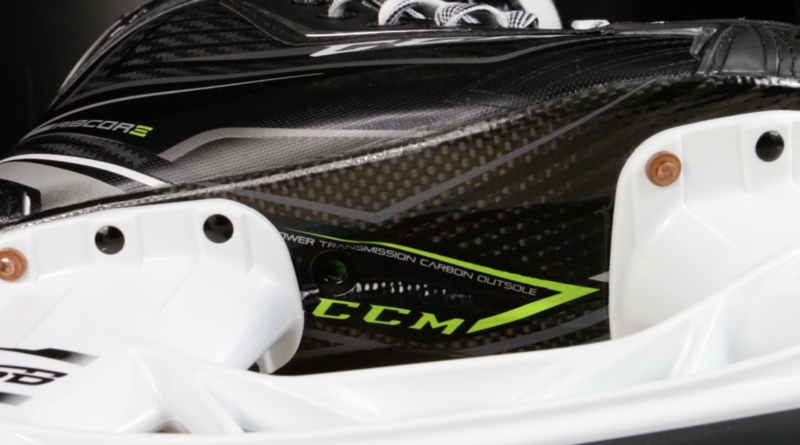 CCM uses what they call their Dual Access Composite with Flex Frame Technology. 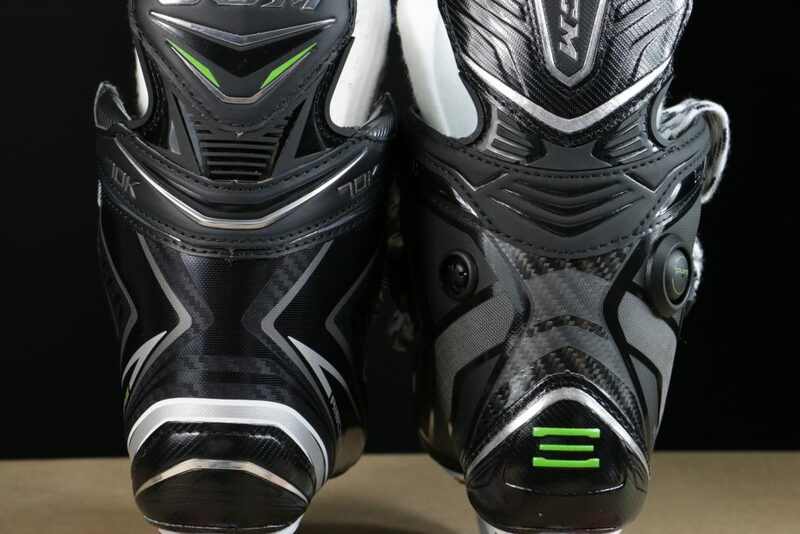 The Flex Frame Technology means it allows you to get a full forward flexion inside these skates, promotes having a full range of motion, really being able to get in over your toes allowing you to perform more naturally and freely on the ice. 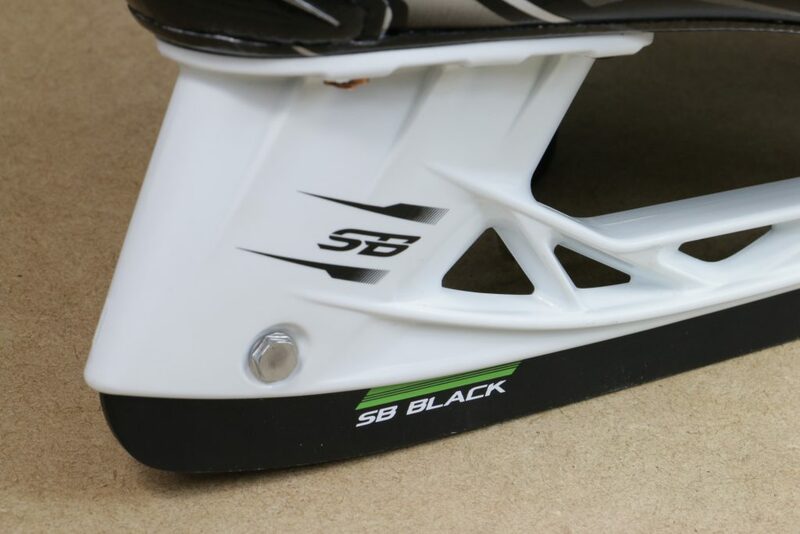 Reasons why this skate has been a big favorite amongst pro players, It will also allow you to get over on your edges more with strategic stiffness zones inside the boot. 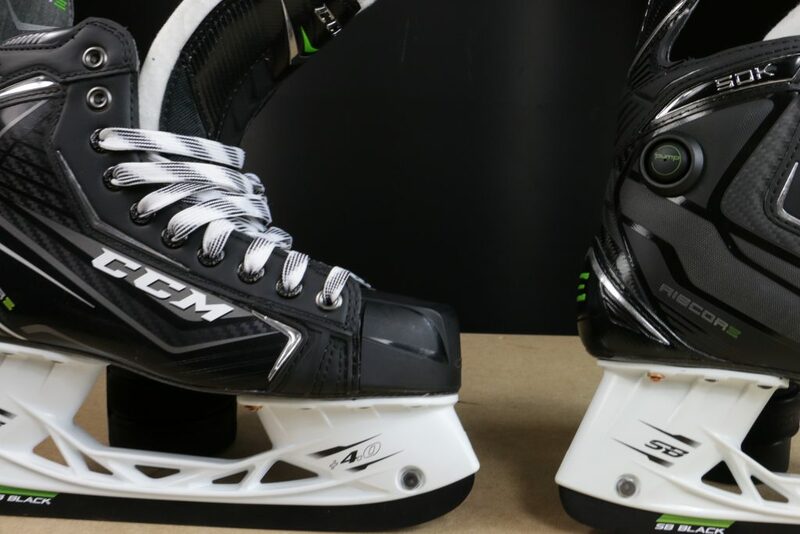 One of the big questions is why CCM didn’t make the 70k’s a one piece boot frame, seen in the Super Tacks and the soon to be released Jetspeed FT1’s. 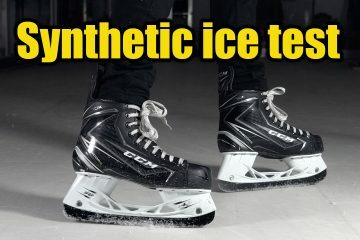 With the 70k’s it’s a completely different style of player that likes these skates, the result of having a one piece boot frame means that the skate structure is incredibly stiff and rigid.Those powerful skaters love a nice stiff skate that is going to be able to offer them the adequate amount of support and responsiveness that they need on the ice to be able to perform the way that they want to.Judging by the responses the 70k’s are getting right now is a lot more than expected prefer a slightly more flexible skate. 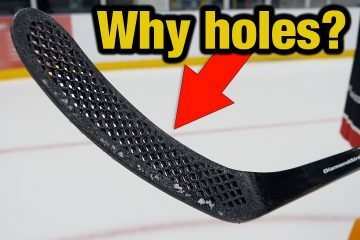 That’s exactly what you get when you move away from a one piece boot frame, the structure of the skate is much softer much more forgiving but it is still adequate enough for an elite level of play. These skates are not going to be too soft for a professional level of playing, players like Sidney Crosby use these skates so it’s a testament to the fact they are more than good enough for the pro players. 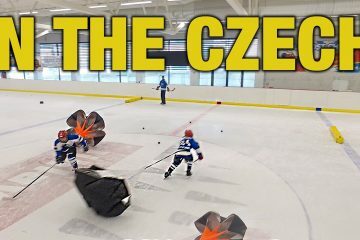 They are just more flexible, more forgiving it allows players that prefer this kind of construction to to perform better on the ice. Being much faster, able to turn much more aggressively because of that forward flexion that you get inside the 70k’s. 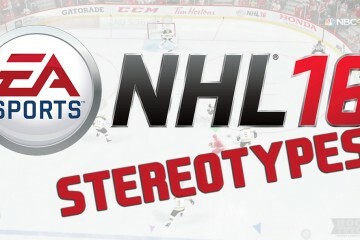 Aside from that it means that if they use a skate like the Jetspeed FT1’s or the Super Tacks which are incredibly stiff, these players might have to use a lot more force a lot more energy and power to get the skate to do what it wants. 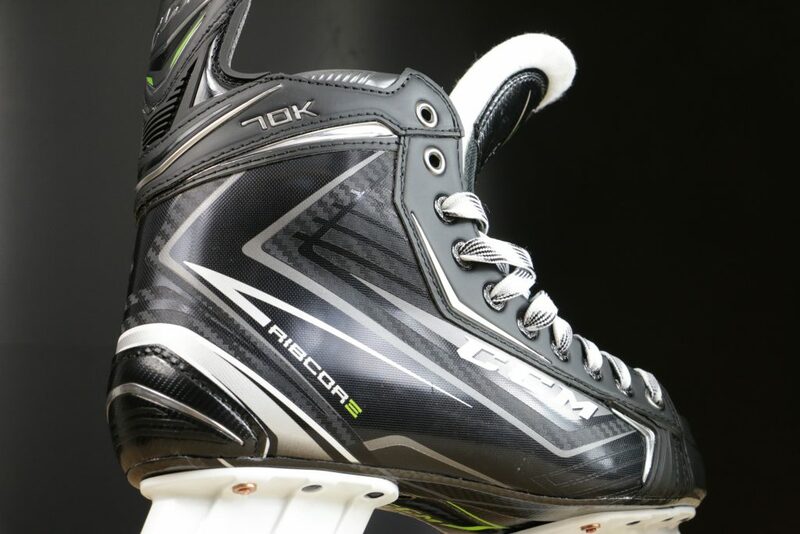 One thing noticed while using the 70k’s versus the Super Tacks and also the Jetspeed FT1’s is the skates were able to do a lot more for the player without having to use so much power and force to get skate to bend and flex, because of how stiff that one piece boot construction is. These skates have been the most surprising pair of boots players have used coming from the previous generations of ribcor skates none of them have felt as good as the 70k’s. CCM Ribcor 70k skates NO PUMP OR LACE LOCK!? On to what has created the most questions about the 70k’s skates and that is going to be the exclusion of the Lace Locking System and The Pump. 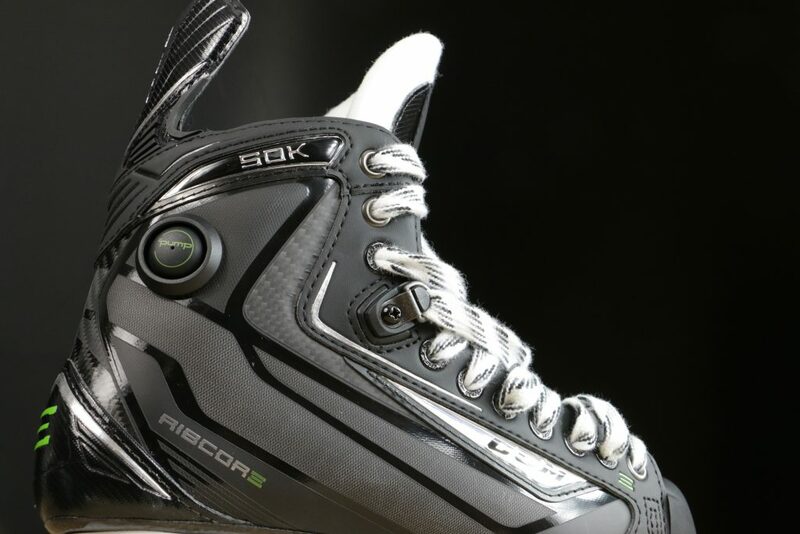 Looking at the previous generation of Ribcor skate we have always seen The Pump and The Lace Locking System, so why have they excluded it. 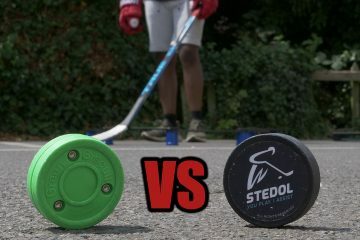 To give you a quick breakdown of the purpose of The Pump when you pumped it up it would inflate the liners and padding around the ankle reducing negative space, gives you a more supportive feel and locking your heel in place making sure there was no bobbing or movement inside the skate. 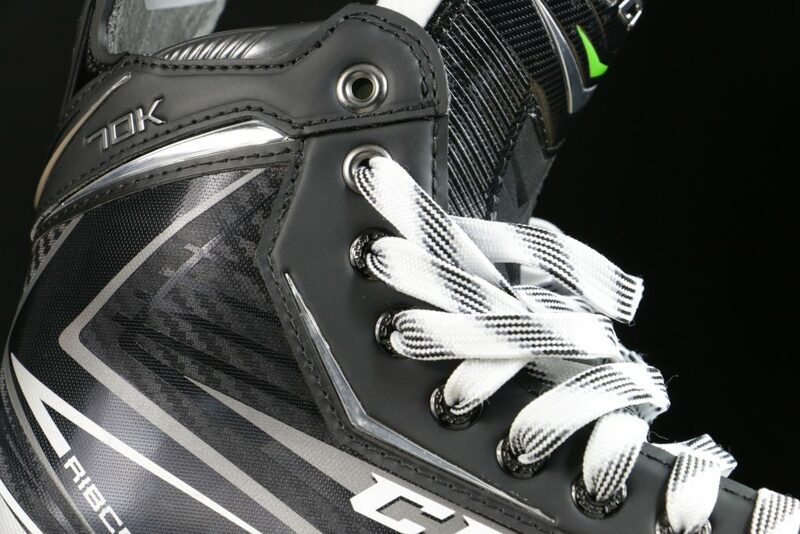 This is what CCM refer to as their High Definition Heel Lock, that is what The Pump did. Now when we move over onto the 70k’s they have excluded this feature out and this is because with CCM’s new construction they have been able to provide those features just using the skates new construction and the new foams that are inside. 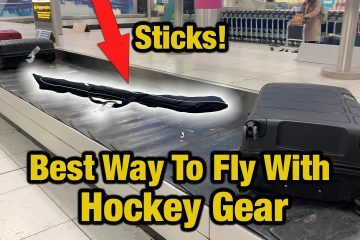 That’s automatically going to save a ton of weight, although The Pump just seems like a tiny button there is a bladder inside the skate and release valve on the other side. That’s a lot of material and that adds weight to the boot, this is a high performance skate aimed at an elite level of play so weight matters. 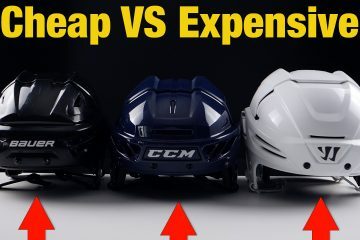 CCM want to try to get the sakte to be as light as it possibly can, that’s why we don’t see the pump in the new 70k’s they don’t need the pump they have all of those features already inside them.CCM have been able to save a total of 160g from the new 70k’s, or 80 grams per skate. Lots of players like The Lace Locking System, but not many players use The Lace Locking System or The Pump so CCM have gone ahead and removed it.Do not forgetting that the lace locking system can be purchased as an extra, so if you go into any good retail store that sells hockey equipment you should be able to find the lace locking system in the accessories section so if you do really want them you can get them and attach them.Since these boot are aimed at an elite level of play CCM is reducing the weight but still maintaining the high level of performance that we expect in these skates. The best way to think about it is this is CCM’s 50k during bulking season and now were are in 2017 were in shedding season and that’s exactly what the 70k’s are doing they’re shredding any unnecessary weight to be as lean as they possibly can and that’s exactly what CCM have achieved here, and of course the 70k’s are fully heat mouldable. 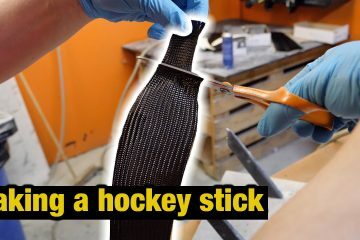 Taking a quick look at the back of the tendon guards you are going to notice that the 70k’s tendon guard doesn’t sit so aggressively when compared to the previous generation the 50k’s’ it definitely affects they way that you feel on the ice, sitting a little bit more naturally helping you feel more comfortable weather is getting ready for face offs or just generally striding,it’s subtle but noticeable improvement. Taking a look at the tongues we are going to see a few upgrades here, both of these tongues are CCM’s Tritech Tongues. Looking at the 70k’s the new white felt is a little bit thicker when compared to the 50k’s, this could just have been the particular pair of skates that were tested. 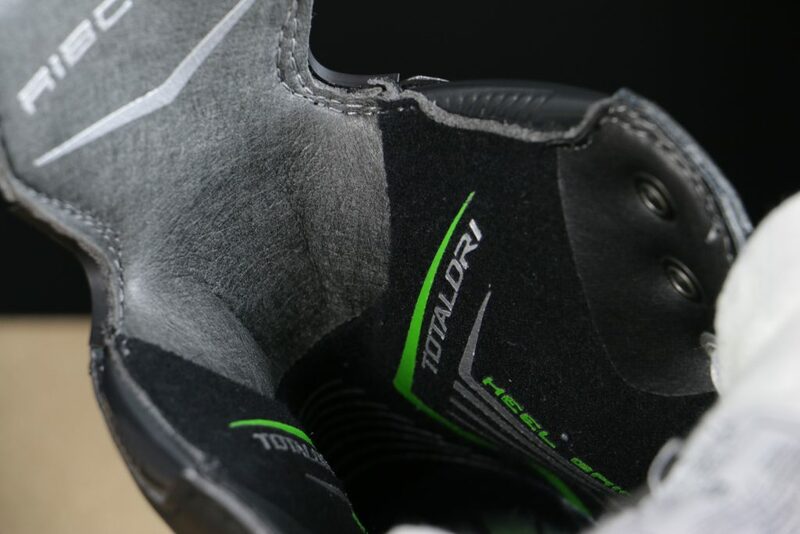 Changes that you will notice are going to be in the metatarsal or the lace bite protection, in the front CCM is using injected plastic in the new 70k’s which reduces the weight so its much lower profile but it still has adequate protection Which is still going to protect you the same way the 50k’s did, it’s just a lot more improved a lot lighter a lot more lower profile. 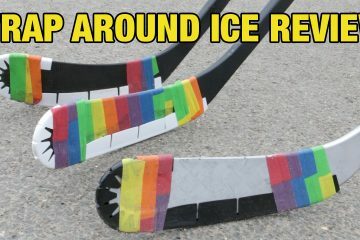 This is going to keep the weight of the skate down but it is still going to adequately protect you against impacts on the ice. 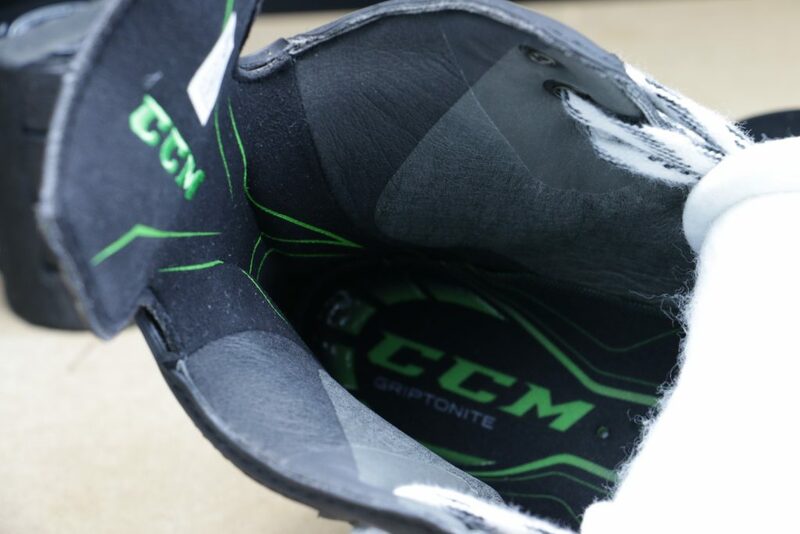 From there taking a look at the liners inside the new 70k’s skates with these CCM are using what they call a Total Dry Liner, if you look inside the skate you will notice that the sides of the liner are black whereas the back is grey. 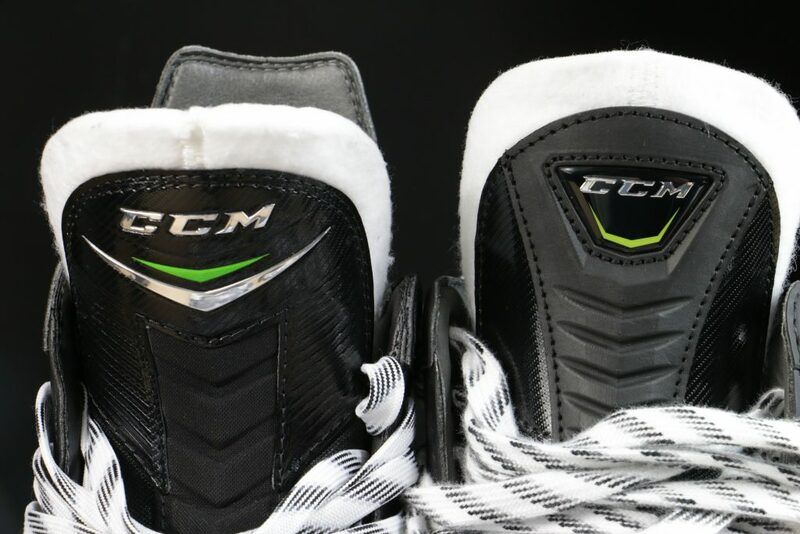 These are actually two different materials, on the back portion of these skates and along the inside that’s a traditional Corino liner, and along the side it’s a microfibre liner. 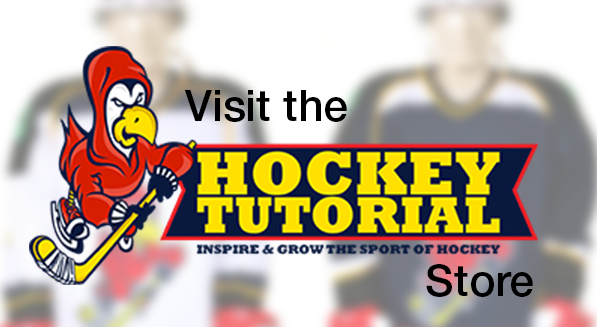 Feeling the liner you will notice that it is a little bit rougher than what you felt in the 50k’s the reason for that is to make sure that the liners last the lifetime of the skates and to make sure that your feet stay planted inside the skate and don’t move about. 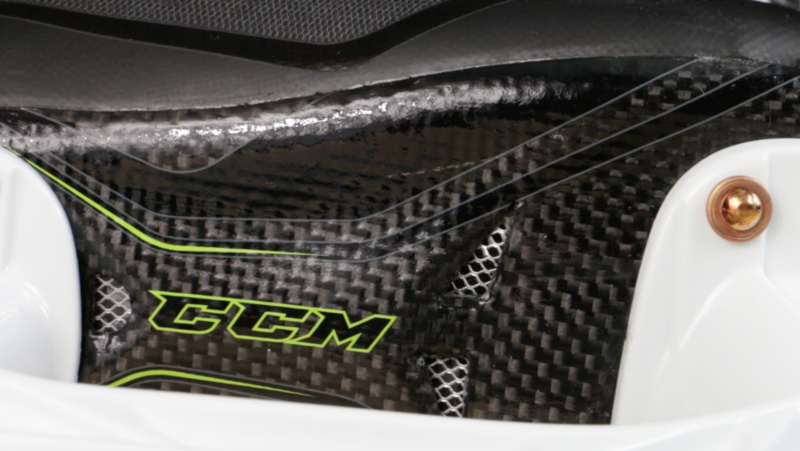 Taking a look at the sides of the skates which we refer to as the high wear areas, CCM have also continued to add additional materials here to ensure that the liners don’t break down prematurely.Another subtle but greatly appreciated change that we haven’t seen over the 50k’s if you look at the neck of the skates on the 70k’s CCM have also added some comfort pads. 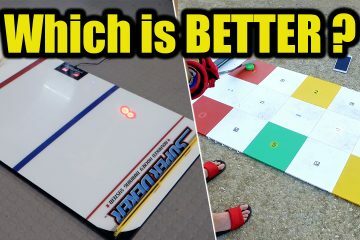 These just alleviate any pressure at one point so when you are turning very aggressively and skating powerfully these comfort pads will help to alleviate pressure at one point so you are not going to have these skates digging into your leg while you’re skating which is a significant upgrade from the previous 50k’s. While on the subject of the internals the biggest and most significant change to the liners of this skate is going to be the memory foam that CCM have added. Earlier on we discussed how the new skates construction provides all of those feature that we had from the previous 50k’s in terms on the high definition heel lock, the reduction in negative space because of how The Pump was able to inflate around your ankle and hold it in place.That’s exactly what these memory foams are able to do, they are incredibly soft to touch, incredibly well padded but because it is memory foam it’s incredibly adaptable. Weather you have a very narrow foot and are going to be using the 70k’s the skates will be able to really immerse themselves and wrap themselves around your foot.Keeping it planted to make sure that there isn’t any negative space inside the boot so you’re able to perform to the best of your ability inside these skates. This is wear these skates are so special because even if you have a slightly wider foot you are still able to be accommodated inside the 70k’s because of that flexible construction. 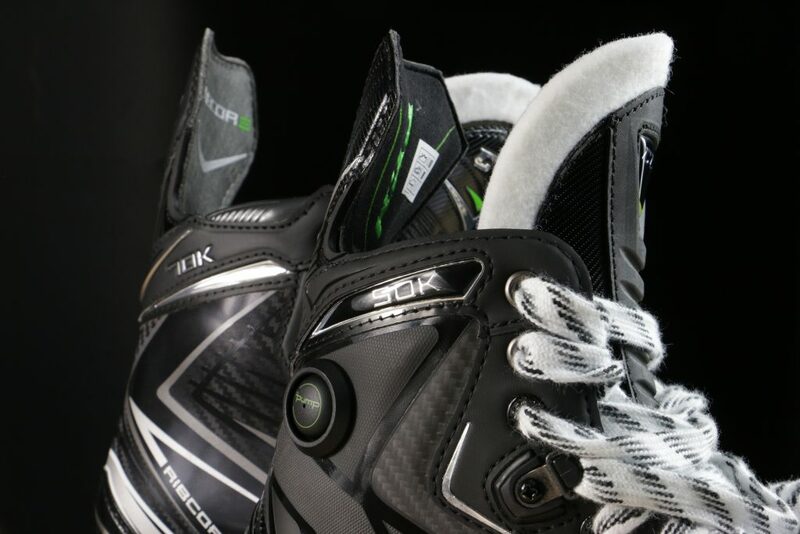 The skate will adapt to the foot that’s put inside it weather its a little wide or narrow you’re still going to be able to perform exceptionally well inside these 70k’s.Those brand new memory foams, that exceptional skate construction along with the flex frame technology is what makes these 70k’s phenomenal. Taking a look at the liners of the 50k’s what we are going to be getting here is to zones inside the liners.The sides are going to be that traditional Corino and the back is going to be what they call a tacky nash.If you touch it you will feel that it’s almost a little bit sticky or it has a little bit of grip. That’s to help make sure that your heel stays planted and that there isn’t any slippage, your feet aren’t moving around in ways that they shouldn’t be inside these skates.CCM have also added some extra material around the high wear areas of the skates that’s just to ensure that they beef up the liner to help them last a little bit longer. Hopefully we have answered all of the questions you had about what has changed between the 70k’s and the 50k’s, as always if there is anything we didn’t answer comment down below and we will answer it as soon as we can. Hello mates, good article and nice arguments commented here, I am actually enjoying by these.